The proposed policy of the City Commission of Phoenix to require all sub dividers to include in their plats space to be used for parks and playgrounds received commendation of REALTORS when it was explained to them recently by W. R. Hartranft of the Phoenix City Planning Commission. This innovative policy challenged private developers to include park land in their subdivisions. The concept reflected a growing activism among civic leaders to create livable environments in America’s cities. It was recognized that clean air and open recreational space are necessary for the healthy development of cities and their citizens. The public health movement, the forerunner of the modern city planning profession, developed Park space requirements. Civic leaders hoped to ensure that growing cities would have sufficient park land, even if county or city funds could not match the pace of residential expansion. It was therefore suggested that private developers be required to provide some of this park space. These proposals sparked a national debate among those in the real estate profession regarding the effects of parks on subdivision property values. Most developers believed that including a park in their site plans would increase property values in their subdivisions or, at worst, would not affect values at all. However, without close supervision of the activities permitted and adequate maintenance of the park, some developers believed that parks might actually become a nuisance to property owners and would in turn lower adjacent real estate values. In March 1928, developers Earl E. Webster and C.W. Stephenson platted the Idylwilde Park Subdivision, one of the first subdivisions platted north of Osborn Road. The developers sought a means by which their subdivision could stand out from all others in historic Phoenix neighborhoods, thereby making the lots more attractive. As a selling point, and in response to the concerns of city planners and other civic leaders, Webster and Stephenson incorporated a three-acre park into the layout of their one square block subdivision. Instead of placing the park at the corner or along the street, the park was situated in the center of the block. Residential lots were arranged in a loop along the outer perimeter of the park. Individual lot dimensions were reduced, but in return lot owners in the subdivision were granted not only use of the park but also a share in its ownership. Homes in the subdivision face the street, while the rears of the homes are oriented toward the park. This distinguishes Idylwilde Park from other European or eastern United States precedents, where the main facades and entrances of the residences face an open green space. Idylwilde houses were placed in a manner that removed the park from public view, there-by ensuring the park’s safety, security, value and appearance. The park was highlighted as the main attraction of the Idylwilde Park subdivision. Idylwilde was not conceived as an ornament for experiencing nature while in the midst of the city, nor was it a place for contemplative strolling. Rather, Idylwilde was tailored to the needs of children, and to the active, recreational lifestyle of the Valley. Labeled “The Children’s Paradise” by the developers, it was indeed a fine play area. Having the park in the center of the subdivision meant that children need not travel any distance to play, nor would they need to cross or play in the streets. The park also offered a convenient vantage point from which parents could supervise their children. Located within the park was a large swimming pool, constructed of native stone. Said an advertisement, “Like the whole of Idylwilde, this pool has an air of distinctiveness, and of class, and when you come out … you will be impressed with the fact that we have planned and built something different.” Also in the park were concrete tennis courts, a children’s playground, and two outdoor fireplaces for picnics, a baseball diamond and a miniature golf course. A double row of Tamarisk trees was planted, which continues to frame the park. Although the miniature golf course and many of the other attractions in the park are gone, its residents still actively use Idylwilde Park as a recreational area. Each speculative home was provided with a General Electric refrigerator plus a Universal In-A-Drawer Broiler Gas Range. These appliances were included to demonstrate that “a home in Idylwilde Park is a home that any woman may be proud of.” The modern design of these appliances, together with the playground and up-to-date, house designs, enhanced the perception of Idylwilde as a modern and convenient place to live. The subdivision’s location within the Osborn School District was another fine attribute… “Their reputation is such that during the school year empty houses are practically unknown in the Osborn School District.” Also, Idylwilde was located along the Glendale branch of the Phoenix Street Railway, which ran along Fairmount, at the north end of the plat, and then turned north above 12th Street. This location gave residents access to downtown Phoenix. FIFTY BATHING GIRLS… Wanted, between the ages of 16 and 25, to assist Miss Idylwilde Beautiful with the christening exercises and to enjoy a swim in the new pool, and to be in the picture that will be taken of the ceremony. Much preparation went into presenting a fine image for Idylwilde Park for its opening day, Sunday, October 7, 1928. Not only was the park landscaped for opening day and persistently advertised, but attendants were on hand to show eight speculative demonstration homes offered by the Idylwilde developers. This was the largest number of demonstration homes ever shown in a local subdivision. The remaining lots were offered for sale to individuals who wished to build their own structures. Four thousand visitors attended the opening ceremonies at Idylwilde. Reports in the Arizona Republican noted, “One of the more impressive features of the day was the christening of the pool in the center of the subdivision. The ceremony was performed by Miss E. Caldwell, who was attended by 25 girls in chic bathing suits.” The objective of the day, of course, was not to provide the people of Phoenix with a lovely place, to have a picnic. Rather, it was to sell the Idylwilde properties. The day’s success can be measured by the $17,000 in Idylwilde property sold that Sunday. The demonstration homes built by the developers were designed in the Period Revival styles popular during that time. 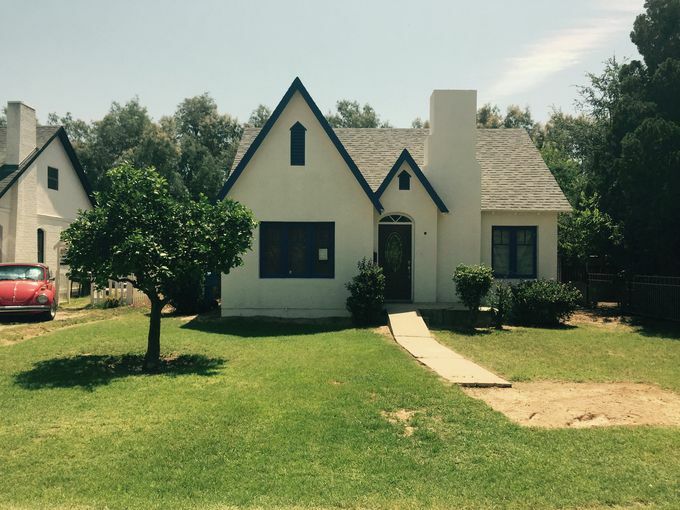 Seven were built in various Bungalow styles, and one was built in a loose Spanish Colonial Revival style. Adobe was used as a structural material in four of the buildings. The developers boasted that each of the buildings was different in style or in interior amenities from its neighbors, such as having a library, den or fireplace. With prices ranging from $4,000 to $5,000, they were affordable to a middle-class clientele. A Bungalow is typically a one-story house with a simple, functional floor plan and one or more broadly pitched roof gables with deep overhangs. A broad front porch with massive square porch columns is a telltale feature. 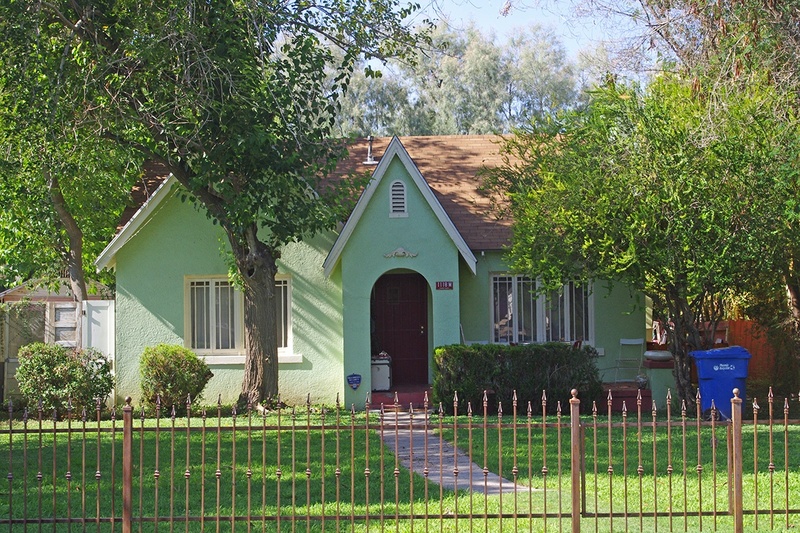 The Bungalow was the dominant style in Phoenix from 1910 to the late 1920’s. Its popularity was based on its low building cost and adaptability to many simple plan variations. The Bungalow style was developed in California and spread through publication of its building plan in building periodicals and popular magazines. Spanish Colonial Revival was one of the many Period Revival styles popular in Phoenix and the nation during the late 1920’s and the 1930’s. In Idylwilde there are only a few examples, which are characterized by stucco walls, tile roofs and the use of arches for windows and other openings. The Period Revival styles evolved from a growing sense of historicism that dominated architecture during the 1920’s and continued through the 1930’s. Another example of Period Revival architecture located in Idylwilde is the English Tudor style, often used for the later Idylwilde homes. The eight original residences are still standing, although some have been significantly changed. Homesites sold quickly, with only eight sites still available by the end of the first month of sale. Residents building their own homes had an interest in the park equal to those who purchased their homes from the developer. Building restrictions included requirements that structures are fabricated with brick, concrete or adobe, and that no hotels, boarding houses or apartment houses are built there. Homes constructed in Idylwilde were required to cost no less than $2,500 to ensure that Idylwilde remain an economically and socially homogeneous community. Similar to many other residential subdivisions at the time, racial restrictions were imposed as well. Many of the first houses built by lot owners at Idylwilde were designed in the English Tudor, Spanish Colonial Revival and Bungalow styles. The English Tudor is a Period Revival style characterized by steeply pitched roofs and various combinations of brick with stone trim. These buildings are usually asymmetrical in form. Buildings constructed in the 1940’s were designed in the Minimal Traditional style. These one-story buildings have low-pitched roofs and ornamentation that suggests some of the earlier Period Revival styles. The majority of the homes in Idylwilde were built by the mid 1940’s, although the final addition to the subdivision was made in 1971. All the original buildings share a common setback from the street and were similar in size, shape, materials and design. Thus, Webster and Stephenson established a common architectural identity for Idylwilde that is still evident in the neighborhood today. “June 11, 1956 … Pot Luck Dinner under the committee of Mrs. Frost Mrs. Davidson, Mrs. Stewart and Miss Forster. The President, Mr. Crowe, opened the gathering in asking Mr. Shaw to say grace before the meal. After the dinner, Mr. Crowe commented that whether by design or by chance, the selection of dishes was extraordinarily good. From the beginning, the shared ownership of the park created strong community ties in the Idylwilde Park subdivision. The park has created a sense of camaraderie that has rubbed off on the entire community. The informal ties among the subdivision’s residents were formalized in 1950, when the Idylwilde Park Club was officially incorporated. This organization remains a strong voice in the neighborhood. The swimming pool is still a vibrant gathering place for residents, and a new gazebo within the landscaped park is the focus of social life in the Idylwilde Park Community.